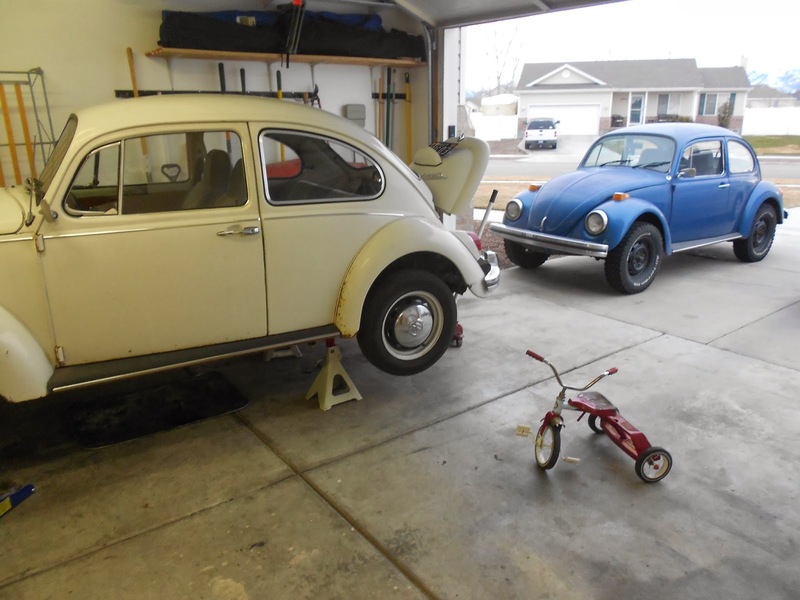 The Bug Boys: Finally pulled the engine out of the bug. 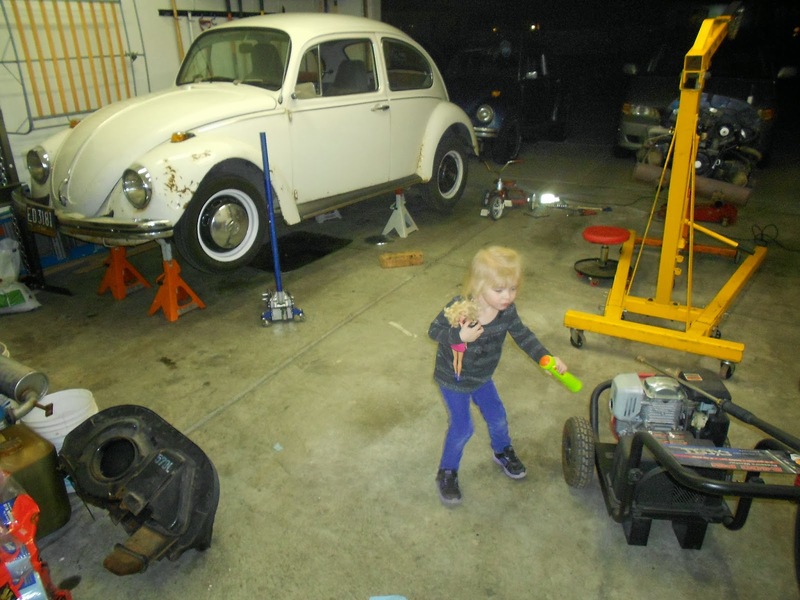 Finally pulled the engine out of the bug. 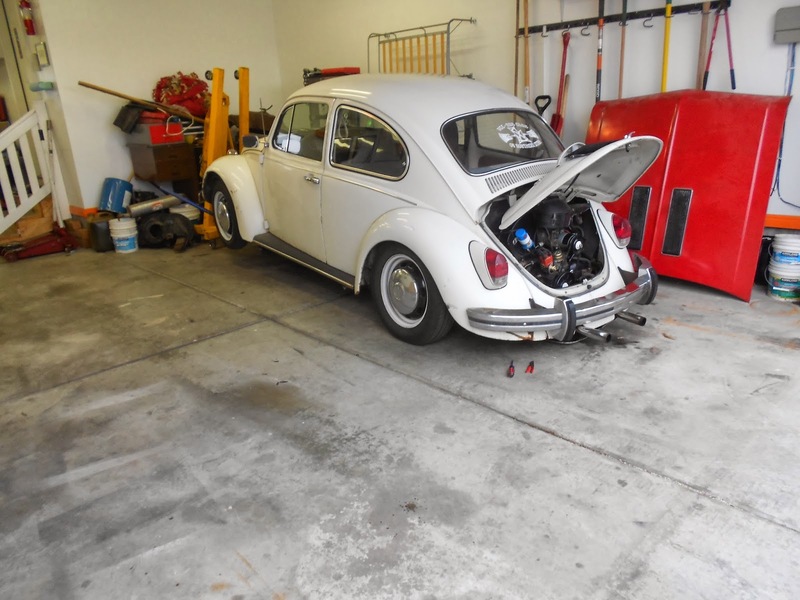 I didn't really feel like it but I forced myself to go in the garage and pull the engine out of my bug. 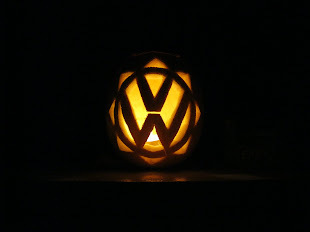 Luckily it didn't take very long and it came out easily. 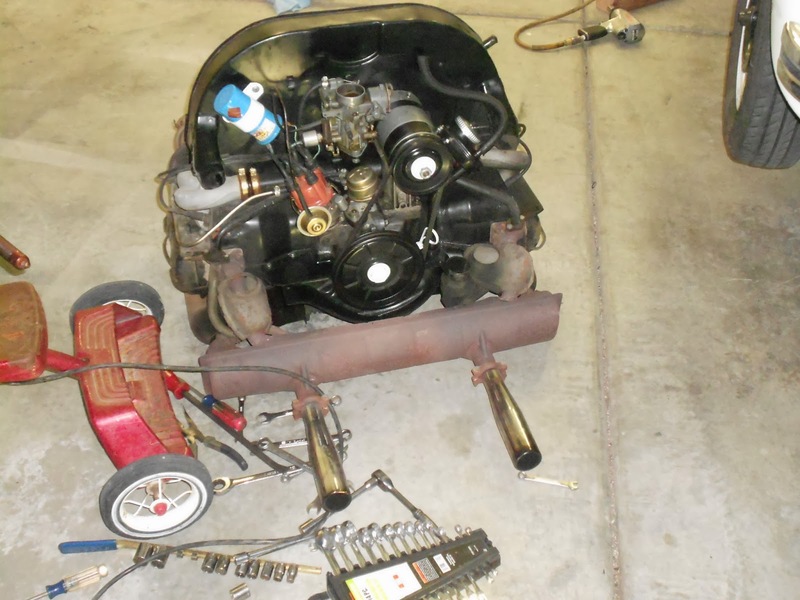 I am pulling the engine out so I can replace the leaking push rod tubes and change out some gaskets. Hopefully this will be worth it and I can have a VW that does not leak. 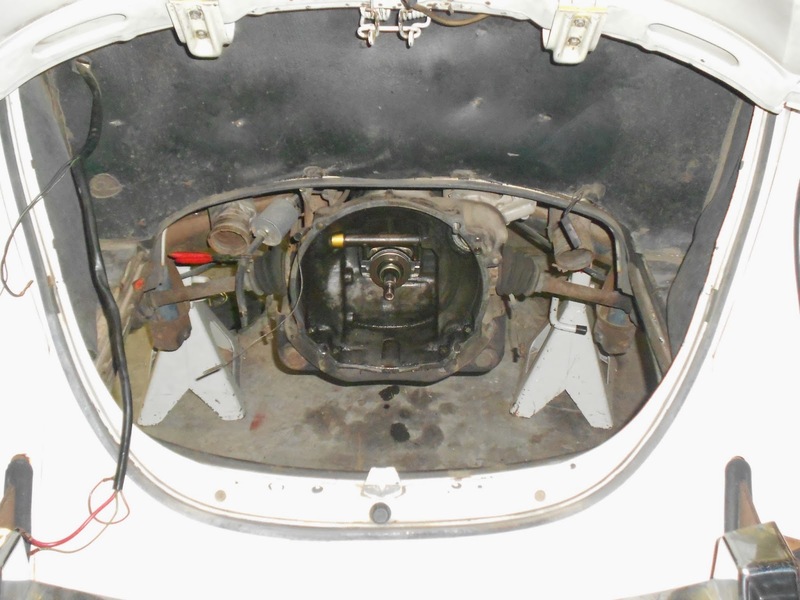 Here are some pictures of the engine removal. 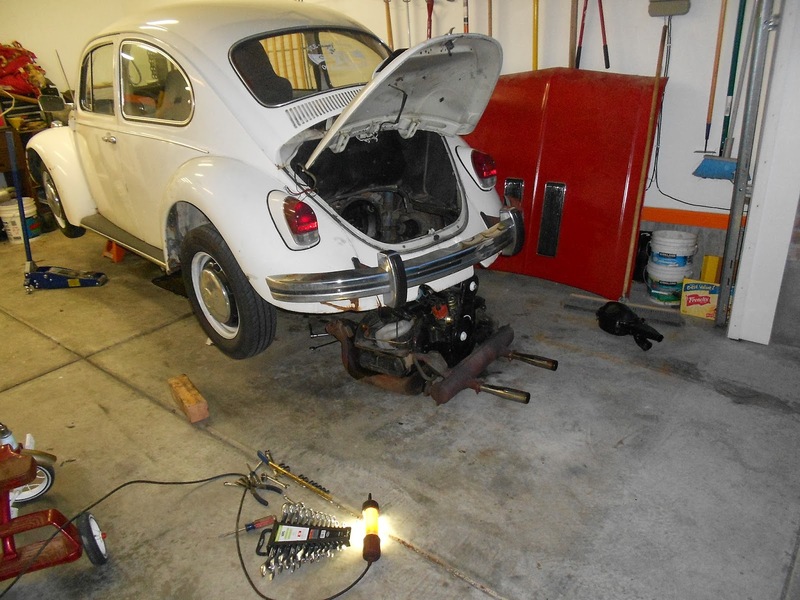 I have to drive my bug up on some 2x4's so I can get a jack under the front end. The worst part is done at this point. It really is that easy to pull a bug engine. 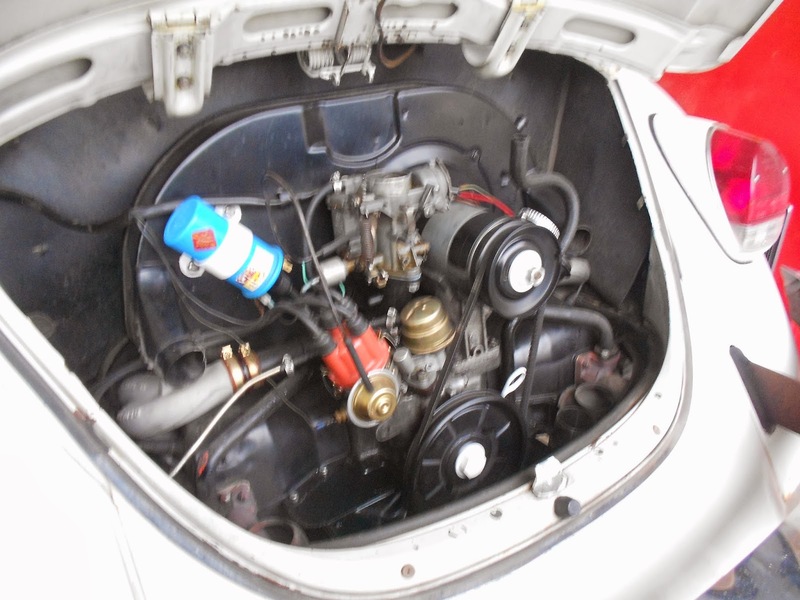 I removed the back engine tin, undid the wiring, removed the air cleaner, the doghouse ducts and disconnected the throttle cable. That's all you need to do up top on the engine. Now you need to go underneath the car. 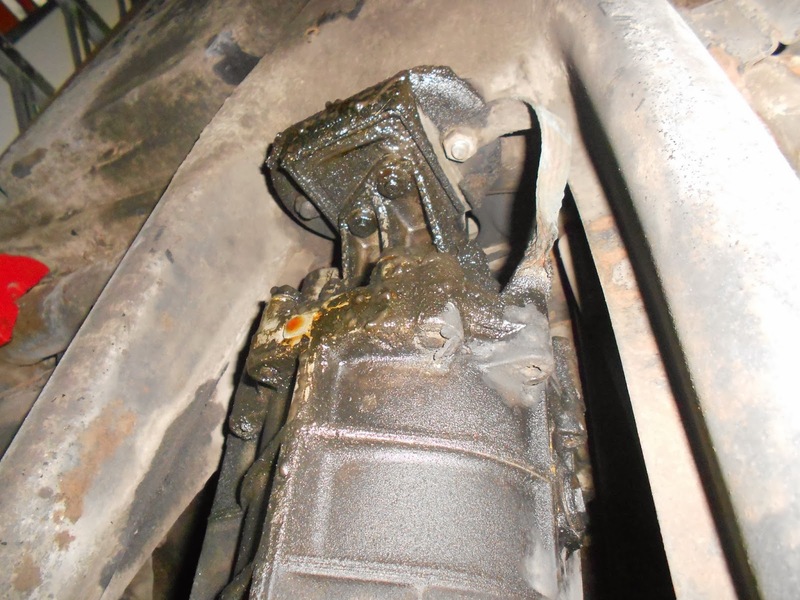 When you get under the car remove the heater ducts, heater cables, pinch off the fuel line and disconnect it and then your ready to remove the 3 nuts and 1 bolt. It really only takes about 20 minutes to get an engine out. Here are some pictures that will show why I am removing the engine. 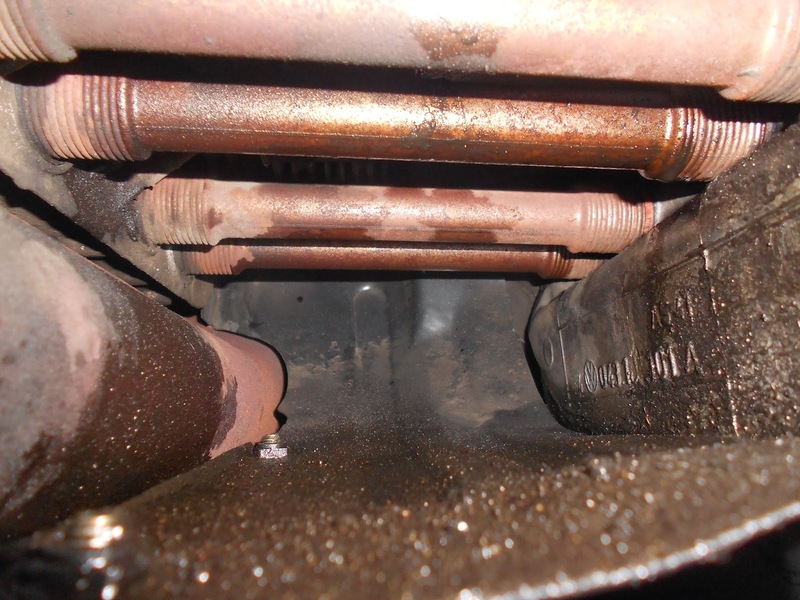 Lots of oil leaks that are driving me crazy. More oil. I really really hate oil leaks. I actually got a headache last year driving home from St. George from the burning oil smell I was getting in the car. That's why I am rushing to get this fixed before I head back to St. George. This is the front of my tranaxle. It has a leak also. I will look into fixing this while I have the engine out. I think I might have to remove the trans to fix this one. And, the engine is out. I installed this engine 3 years ago and it runs awesome. I just wish it didn't leak. I also have 1 cylinder that is lower in compression then the others. I might address that also. I am going to do a leak down test and see if I can determine why it's low and then go from there. 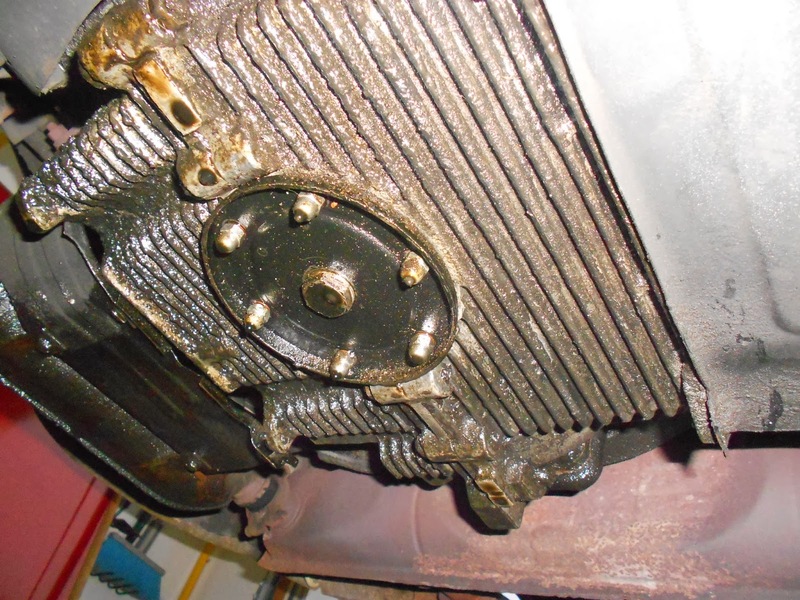 The throw out bearing is still in great shape and the clutch is good so I will leave all that as it is. I do need to adjust the clutch cable while I have it in the air. Ellie hung out with me in the garage for awhile. She entertained me by singing songs with her "microphone" and then danced to her own beat. I have all the stuff I will hopefully need to get this engine leak free. 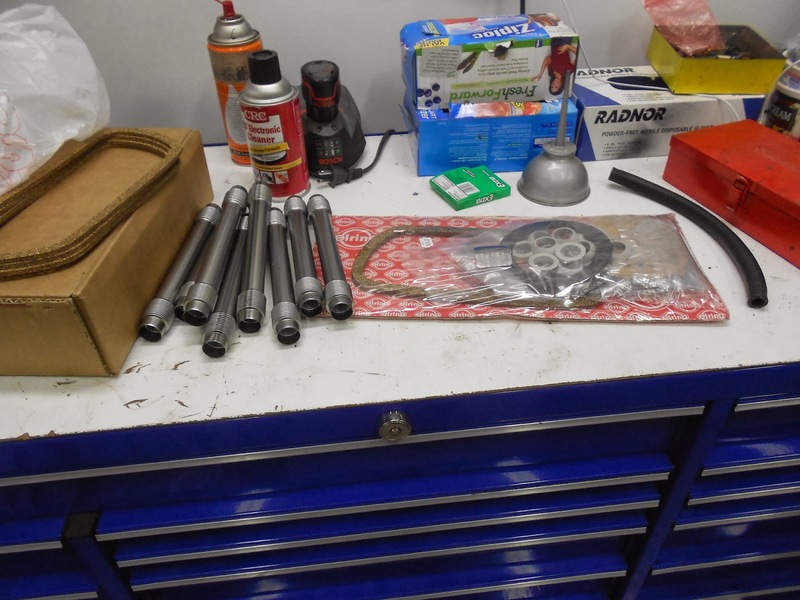 Here is a complete gasket kit along with some new push rod tubes. Now it's down to cleaning the engine again and resealing everything. I have a deadline to meet so I can't mess around too much. I do my best work under pressure though. 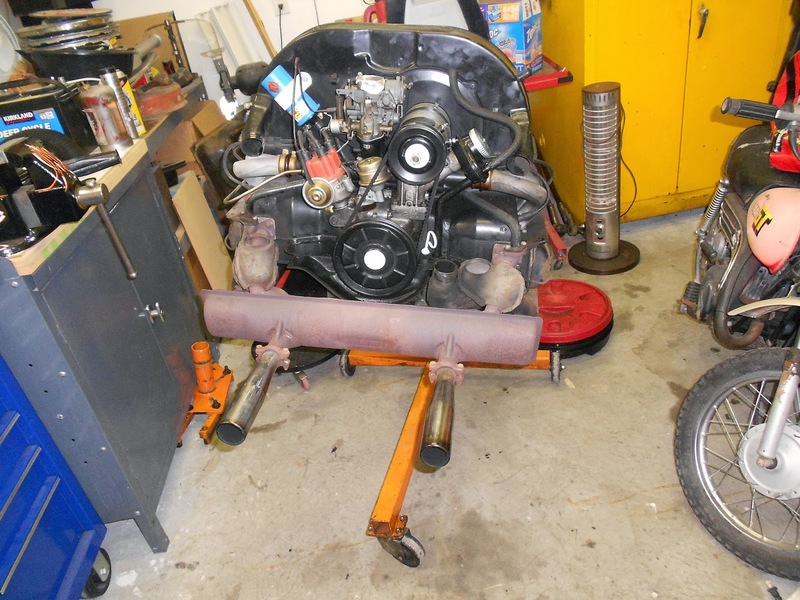 Here is the engine up on the stand and ready to be disassembled. I think I will take it into work this week after I get the doghouse off and pressure wash it so it's nice and clean. 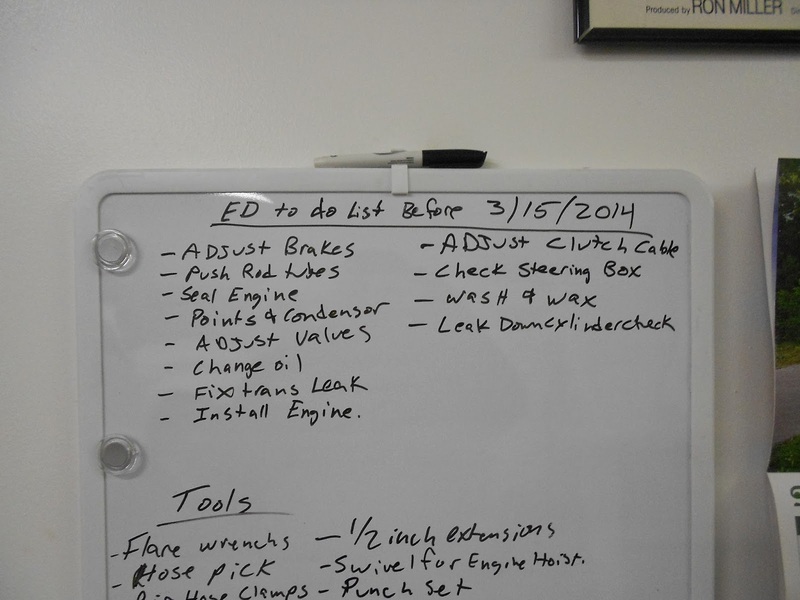 Here is my to do list that I have to accomplish before March 15th. It seems like a lot of stuff to do. I wish I would of started e few weeks earlier but that is life. I still have 4 weekends to accomplish it and some weekdays when time permits. It should be a breeze unless I have to pull the trans. Then it might be pushing it. Check back and see if I end up thrashing on it late into the night on the 15th of March. Ha ha. It's always a possibility! Digging Deeper then I wanted. Enjoying the Drive part 7.